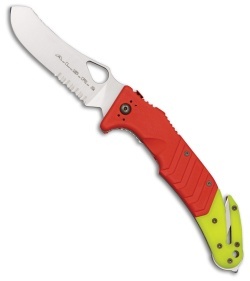 The Fox Knives A.L.S.R. folding knife with hi-viz red/yellow forprene handles and partially serrated blade, integrated strap cutter and glass breaker is a first responders' go to tool. The blunt tipped blade is made of Bohler N690Co stainless steel with a partially serrated edge and a black coating. A large teardrop thumb hole allows for easy one handed opening. The hi-viz red/yellow forprene handles features plenty of functional jimping and a groove texture for a rock solid grip in hand. The integrated strap cutter makes quick work of straps and webbing while posing no threat to the patient. The pommel of the knife includes a glass breaker tip for when a pane of glass stands between you and immediate entry to a building or vehicle. 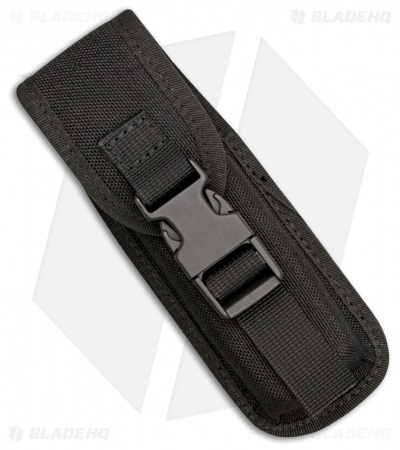 Includes black ballistic nylon sheath for easy carry.